Stay tuned for the full-length climbing feature coming soon. For the past 8 years Peak Experiences has partnered with Richmond Sportsbackers to make the Boulder Bash one of the most popular events at RiverRock! Highlights of Dominion Riverrock 2017 in Richmond, Virginia. Nathaniel Coleman, Alex Puccio, Solomon Barth, Ben Hannah, Jesse Grupper, and Kerry Scott. We Need Your Help! Volunteer and Be Part of the Action! 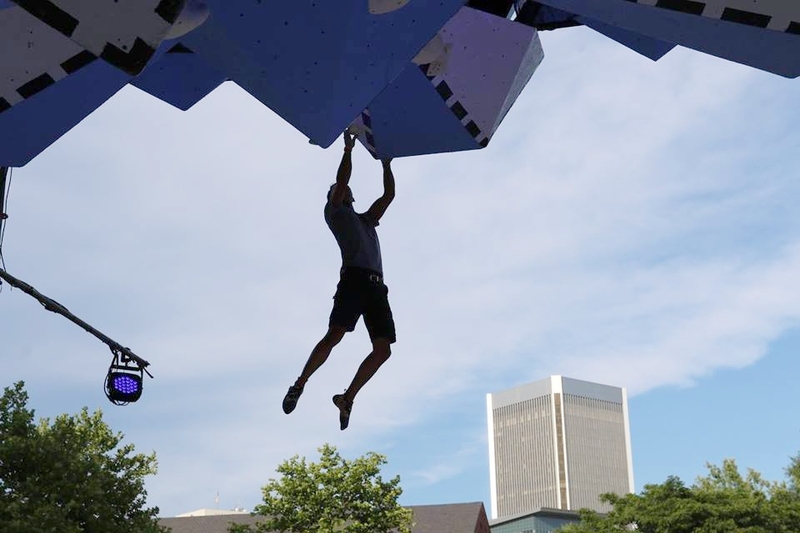 -The citizen’s wall is mainly for kids' to try out climbing at Riverrock, volunteers will spot folks on our mini wall or check wristbands, all while getting a nice tan. -The boulder bash gets you behind the scene to either judge, manage pre-climb isolation, score, or run scorecards for the main competition, all while still getting a tan. -A different perspective on competition style climbing. We also are requiring that anyone working the competition wall also works at least one hour at the citizen’s wall to take care of the kiddos.